The world renowned Perth Mint in Australia has released this new coin featuring one of the most fearsome creatures on earth. The Saltwater Crocodile or Crocodylus porosus is the largest of all living reptiles, as well as the largest terrestrial and riparian predator in the world. The males of the species can grow up to 6.7 metres (22 ft) in length and weigh as much as 2,000 kg (4,400 lb), though most often averages between 4 and 5 meters (14 and 17 feet) long and weighs between 400 and 1,000 kg (880 to 2,200 lbs). Due to their size and power they are able to take almost any animal that enters their territory, from fish and birds right up to humans, this predator is one of the greatest in the world. It is not surprising that many cultures have revered them for their prowess and fearsome nature. The reverse features a design by Natasha Muhi that features a large saltwater crocodile with it's mouth open and the details of its leathery hide and sharp teeth shown to great credit. 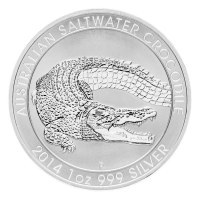 It is surrounded by the words "Saltwater Crocodile 2014 1 oz 999 Silver" and the traditional Perth Mint "P" mintmark. These beautiful one ounce 999 pure silver coins are limited to a world wide mintage of only one million and are sure to sell out fast. 1盎司2014年咸水鳄银币 The world renowned Perth Mint in Australia has released this new coin featuring one of the most fearsome creatures on earth. The Saltwater Crocodile or Crocodylus porosus is the largest of all living reptiles, as well as the largest terrestrial and riparian predator in the world. The males of the species can grow up to 6.7 metres (22 ft) in length and weigh as much as 2,000 kg (4,400 lb), though most often averages between 4 and 5 meters (14 and 17 feet) long and weighs between 400 and 1,000 kg (880 to 2,200 lbs). Due to their size and power they are able to take almost any animal that enters their territory, from fish and birds right up to humans, this predator is one of the greatest in the world. It is not surprising that many cultures have revered them for their prowess and fearsome nature. The obverse of the coin features the Ian-Rank Broadley effigy of Queen Elizabeth II and the words "Elizabeth II Australia 50 Cents" and the artist's initials. The reverse features a design by Natasha Muhi that features a large saltwater crocodile with it's mouth open and the details of its leathery hide and sharp teeth shown to great credit. It is surrounded by the words "Saltwater Crocodile 2014 1 oz 999 Silver" and the traditional Perth Mint "P" mintmark. These beautiful one ounce 999 pure silver coins are limited to a world wide mintage of only one million and are sure to sell out fast.